Nowadays, Soho is mostly known for luxury shopping rather than the groundbreaking artistic work for which it was known in the past. 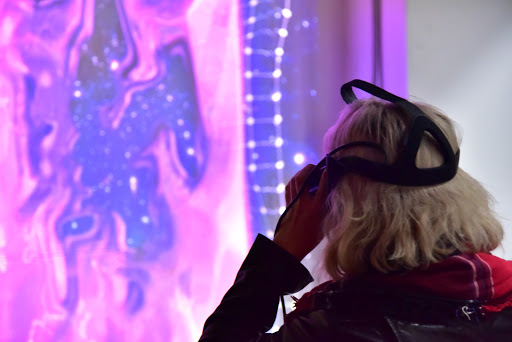 Earlier this month, a new space for digital art called The Current Museum opened its doors at a temporary location on Sullivan Street. 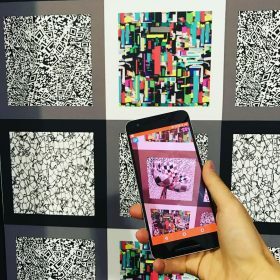 Its group exhibit Test Patterns takes digital art out of the box (screen) and showcases digitally-influenced works of all mediums and forms. The corners of The Current have screens set up or VR stations to explore, but much of what occupies the main area is 2D art on paper or similar materials. The wide-open space and bountiful natural light of the main floor presents a unique challenge for digital art in particular, as the combination of suns and screens isn’t exactly a match made in heaven. The Current’s chairman, Will Nathan, tells me that this window setup is part of why they’re aiming to relocate come December, but in the meantime they’ve taken advantage of the light-filled space to play with what makes digital art what it is. Some of these are as simple as print-outs of computer-crafted works. Daniel Temkin’s piece is made up of a pleasing assortment of thin black lines. Its origin story is less than simple: he loaded a file of a black triangle into Photoshop and messed with the raw file until it became unrecognizable. Nearby, Nitzan Bartov’s print displays a repeating 3D model of the Azrieli Center towers in Tel Aviv. Each model has more and more disruptive code injected into it, until it looks nothing like what it began as, showing the insidious potential of a line of text. Other 2D works are more traditional, but at the same time unexpected. Kawandeep Virdee, a programmer, is showing a painting, but one that was crafted according to the same algorithmic methods he uses in his main line of work. The result would not be out of place at a traditional, non-digital art show. 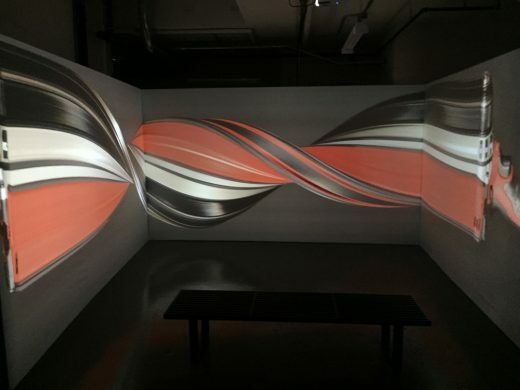 Several installations use digital creation tactics to present something that is not outright “tech-y,” instead taking naturalistic aspects of real life to manipulate and intrigue viewers’s senses. Many of these are audio-centric, like a piece that plays recorded vibrations from MoMA able to be felt from one of The Current’s doors. The work questions which sensorial elements must be in place for a location to be perceived. I certainly wouldn’t have known the source of the sounds unless it was explained to me, but perhaps my subconscious would have. Another sound piece is more location-specific, like Seth Cluett’s sculptural and audio work, self-described as made from “some weird psychoacoustic stuff and some science that [Cluett] figured out.” On one large gallery window, there’s a small object containing a distorted mirror, compelling you to look outside but making the task impossible. Meanwhile, an endless loop of audio sourced from the very streets outside the gallery plays on multiple speakers, sounding abstract one moment and distinct the next as it cycles from the sounds of leaves to the beeps of traffic. 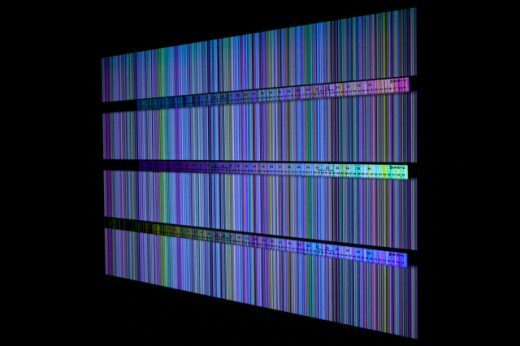 Test Patterns isn’t just presenting alternate visions of digital art, it also has the good old on-screen creations one would expect from the genre. The ever popular virtual reality is also present, in the form of Hyphen Labs’s NeuroSpeculative AfroFeminism, an experience centered on creating 3D models of black women that will then be available for use in marketplaces for VR developers, effectively diversifying the bodies of the virtual realm. Other pieces combine 2D and digital aspects in unexpected ways, such as Claudia Hart’s The Flower Matrix. To the naked eye, it looks like a wallpaper resembling a QR code, appearing digitally-influenced in that way. But when you download an app and look at the piece through a phone screen, the image instantly changes, turning into a blooming psychedelic flower. More awaits in the darkness downstairs. Video art experiment TRANSFER Download, by TRANSFER Gallery, has set up a multi-projector video “playlist” below the Current that transforms the small space into a multifaceted world of its own. Through a small selection screen, you can choose from a variety of videos to become immersed in, as they occupy several walls of the room at once. One is made of animated GIFs, one is a 4K video, and one is a video recording of a VR experience turned accessible to the human eye. In total, the customizable experience lasts one hour. Not only is The Current Museum expanding notions of what digital art is, they are also acting as more than just an art gallery. Throughout the rest of their time on Sullivan Street, they’re hosting a wide variety of events, including panel discussions on art and technology and a “Code and Craft” night, billed as the nerdier answer to a Drink & Draw. Their time in the Soho space will come to a close in mid-December, but it’s not going out quietly. The grand finale, at least until they find a new location to set up in, will be a dance party bumping until 1 am involving VR, digital art, and of course, drinks. If you think VR makes you dizzy during the day, imagine trying it buzzed. The Current Museum at 60 Sullivan Street is open 11 am to 6 pm Monday through Friday and by appointment until December 15. Update, November 18: The original version of this post was revised to correct the spelling of artist Daniel Temkin’s name.